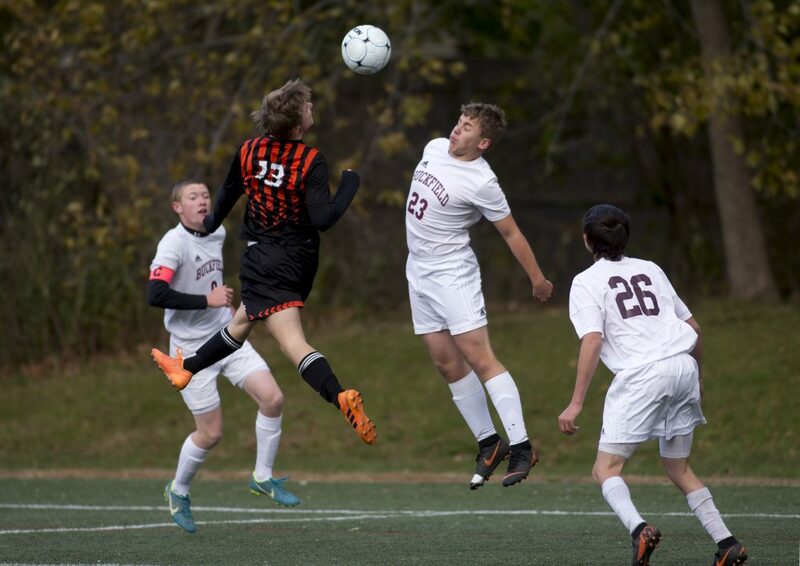 YARMOUTH — One year after missing the playoffs, North Yarmouth Academy’s boys’ soccer team is on the brink of bringing home some hardware. The top-seeded Panthers scored early and often and went on to a 7-0 victory over No. 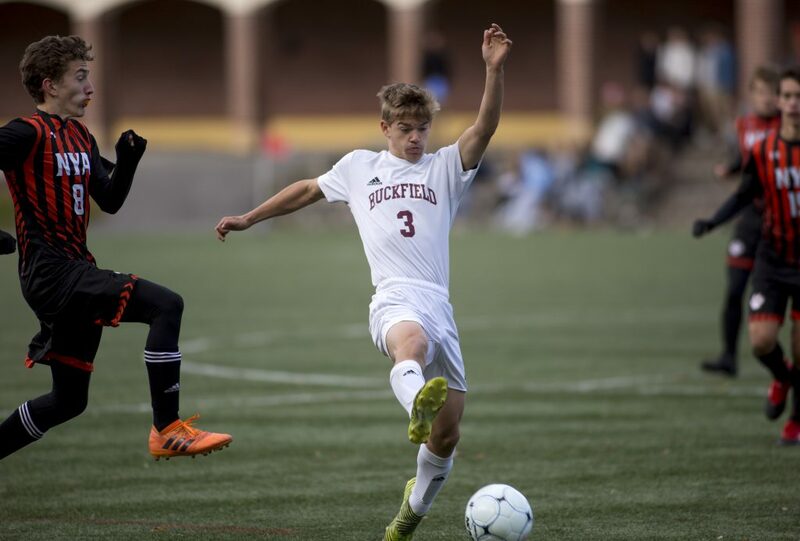 4 Buckfield in a Class D South semifinal Thursday afternoon at Lewis Field. 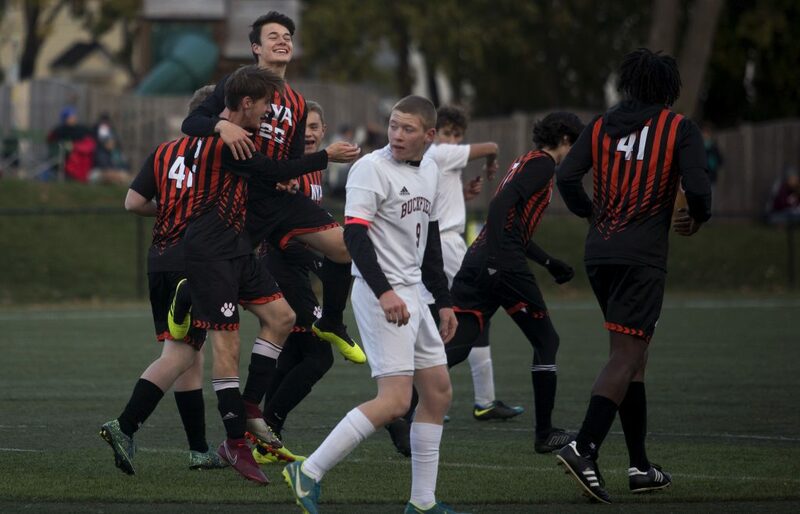 Ryan Baker led a balanced attack with three goals and Alasdair Swett added a pair as the Panthers (14-2) advanced to host the regional final Wednesday against either No. 2 Greenville or No. 3 Temple Academy. It took 78 seconds for the Panthers to score their first goal. 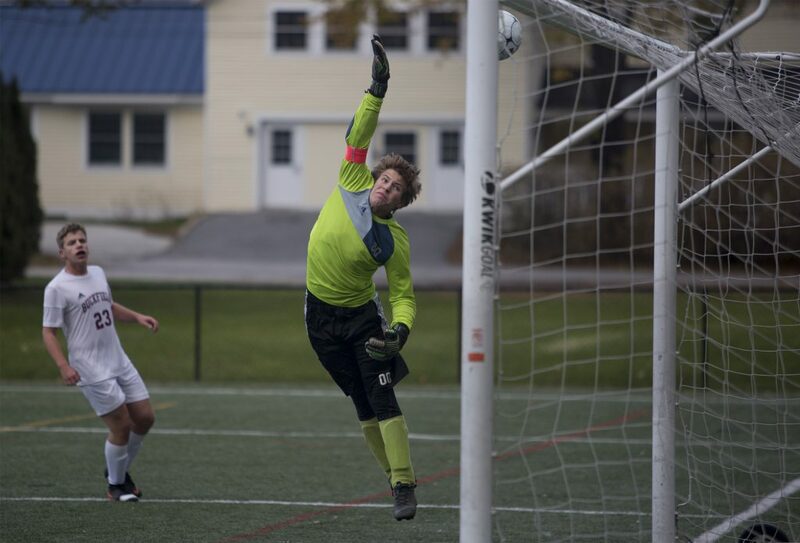 After a failed clear by the Bucks, Chas Rhode pounced on the ball and sent it past goalkeeper Richard Kraske. 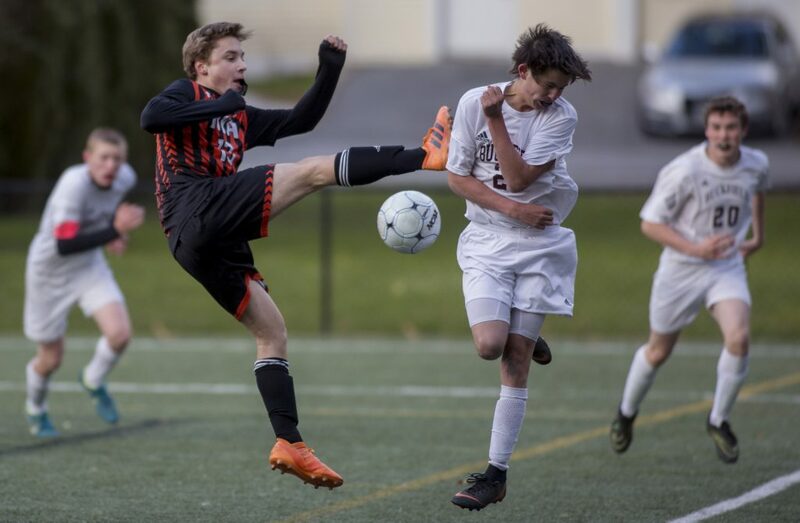 Seconds later, play was halted for over 20 minutes when Buckfield senior Shane St. Pierre suffered an apparent seizure after colliding with NYA goalkeeper Julian Etauri. St. Pierre was reportedly coherent when he was taken away by medical personnel. 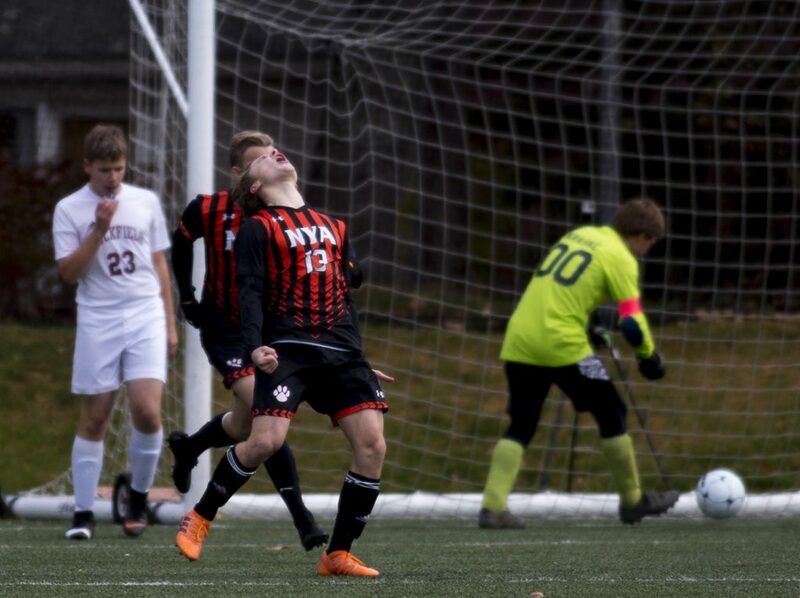 When play resumed, NYA continued to pressure and was rewarded when Baker scored his first goal, a one-timer, in the 16th minute. Swett got his first goal, from Baker, with 18:34 to play in the half and the Panthers took a 3-0 advantage to the break. NYA didn’t relent when the second half began as Baker scored on a corner and Swett finished in a three-minute span for a 5-0 advantage. Baker got his hat trick with 26 minutes remaining and Reese Merritt scored on a rebound with 22:50 left to cap the scoring. NYA enjoyed a 19-3 advantage in shots and took 15 corner kicks to none for the Bucks. Etauri made three saves for the Panthers. Buckfield (11-4-1) got 12 saves from Kraske. 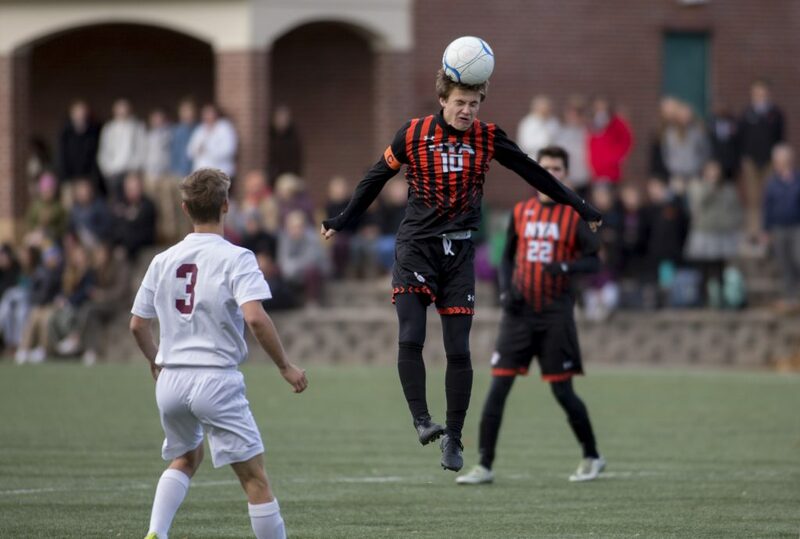 NYA doesn’t know its next playoff opponent, but with an opportunity to advance to the state final for the first time since 2010 and win a championship for the first time since 2005, the Panthers will focus on what they do best.